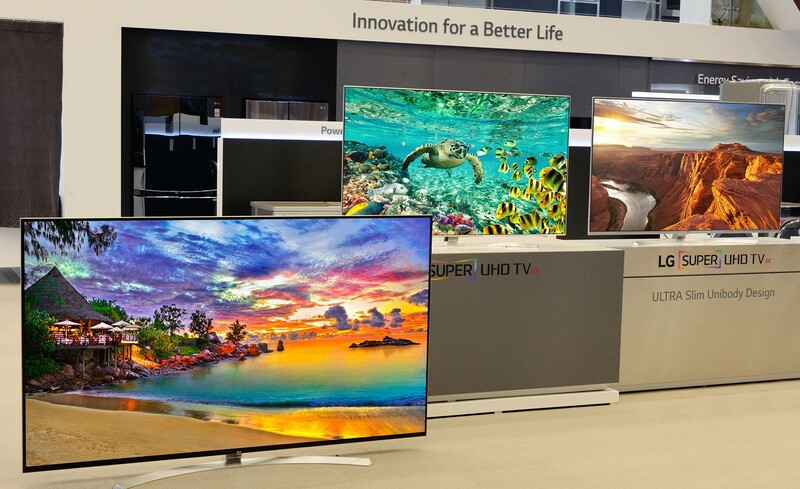 SEOUL, Jan. 3, 2016 — LG Electronics’ newest and most innovative TV products will take center stage at the 2016 International Consumer Electronics Show (CES) in Las Vegas next month. Leading the company’s IPS TV offerings will be the 65-inch UH9500 and 86-inch UH9550 and SUPER UHD TV 65-inch UH8500 and 75-inch UH8550. The premium SUPER UHD TV models offer higher color reproduction rate, advanced picture and sound-enhancing features including HDR (high dynamic range) and LG’s alluring ULTRA Slim design. Both LG’s top-of-the-line UH9500 and UH9550 units boast the most advanced IPS display in the industry with innovations such as True Black Panel and Contrast Maximizer. True Black Panel is a proprietary technology that minimizes reflections and enhances contrast ratio for a more comfortable viewing experience while Contrast Maximizer delivers more depth and contrast by separating objects from their backgrounds. HDR Plus is the technology that enables the UH9500 and UH9550 to show 4K HDR content as they were meant to be seen. What’s more, LG’s ULTRA Luminance technology greatly enhances contrast between dark and bright areas, greatly enhancing the HDR effect. And with HDR-compatible HDMI ports and an SDR-to-HDR conversation engine, viewers can enjoy near-HDR content from any standard source. To enhance color reproduction, LG’s ColorPrime Plus magnifies the range of colors that can be displayed on the screen. The technology utilizes a broadened color spectrum to render a wider range of hues and shades, creating images with greater depth and realism. Another innovation, Billion Rich Colors, uses the 10-bit panel and 10-bit processing power to give the UH9500 and UH9550 the ability to render over one billion possible colors. And with support for BT.2020, the next-generation standard for broadcast and distribution, these TV models are future-proof with a higher color reproduction rate. The UH9500 employs LG’s new design concept, making it even thinner than its predecessor. By reducing the gaps between the panel and back cover chassis, the ultra-thin 6.6mm screen depth and near invisible bezels combine to give the appearance of the TV floating on air. And the UH9500 is second to none when it comes to sound. LG worked with high-end audio pioneer harman/kardon worked to develop a speaker system that could deliver high quality, detailed sound. LG’s new Magic Sound Tuning function measures and analyzes the viewer’s environment and makes adjustments to customize the sound to the room’s specific conditions. Similar to the UH9500 and UH9550 in features, the UH8500 and UH8550 also offer ColorPrime Plus, Billion Rich Colors, ULTRA Luminance and Contrast Maximizer in a slightly different design configuration. LG will also take the wraps off its first production-ready 98-inch 8K SUPER UHD TV with plans to begin shipping in the second half of 2016. LG’s SUPER UHD TVs with HDR will be on display in Central Hall Booth #8204 from January 6-9 in the Las Vegas Convention Center. For more information about LG’s products at CES 2016, please visit www.LGnewsroom.com/ces2016 .